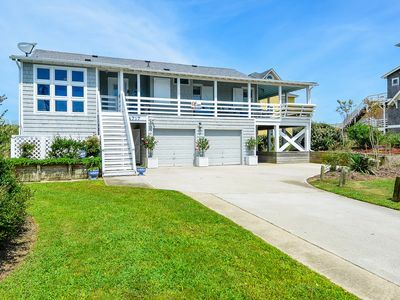 Expansive terraces that overlook the blue Atlantic, a state-of-the-art recreation room and a home theater are just some of the hallmarks of this custom-designed oceanfront home in Shores at Nags Head. This unique 5,000 square foot retreat blends SAGA Construction's award-winning design with modern features, trend-setting amenities, and memorable decor. As you make your grand entrance onto the ground level, you will be awestruck by the luxurious sights before you. 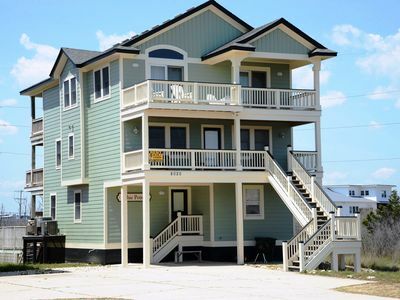 This level provides the perfect balance of entertainment, relaxation, and fun. 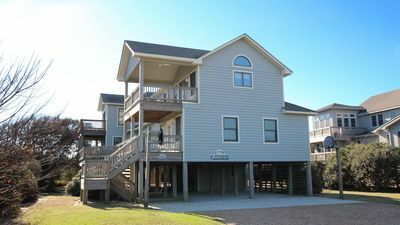 The recreation lounge features a large flat screen smart TV, billiards table, shuffleboard, cocktail table/foosball table and wet bar with sink and full refrigerator. The private home theater has a combination of tiered seating, as well as a bar in the back with additional seating. Not only does the theater room feature electronics, audio/visual and lighting by a nationally recognized and award-winning company, but the entire home is designed to have the latest and greatest technology that is comfortable to use even if you do not have any technical experience. 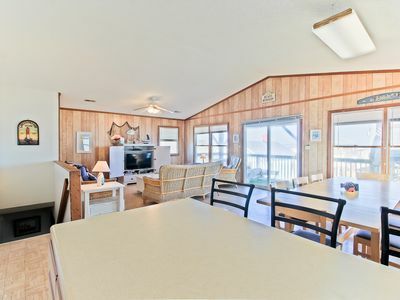 You will also find a King Master suite on the ground level. Laundry facilities include two stackable washer and dryer units. 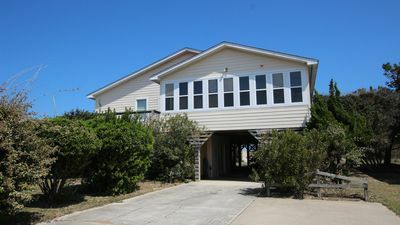 A half bath is conveniently located on this floor and is easily accessible from the pool area. Speaking of your private pool, this pool has it all! 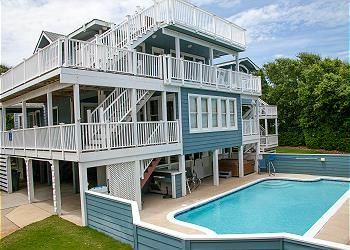 With the main pool being a luxury 28x17 heated pool, you'll also find a kids pool, lounge deck and 7x20 adult spa with jets. 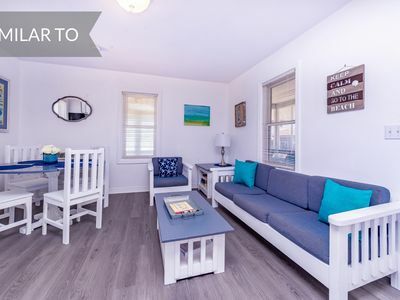 The middle level is primarily dedicated to sleeping accommodations including 3 King Master Suites! 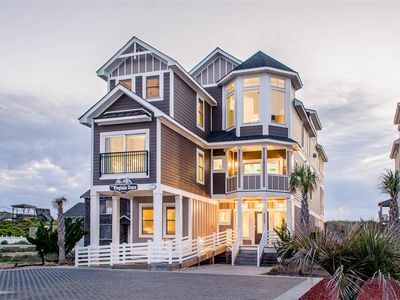 The top level features an expansive great room with a vaulted ceiling, gas fireplace and sweeping ocean views. 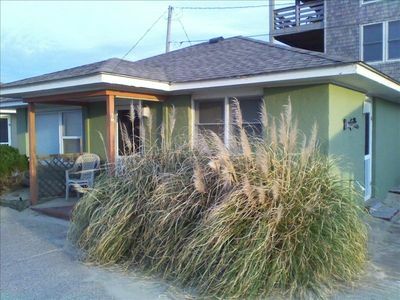 There is also a dining area, a fully-equipped gourmet kitchen, wet bar, and a half bath. A soundside sitting room and King suite feature amazing sunsets over the sound. 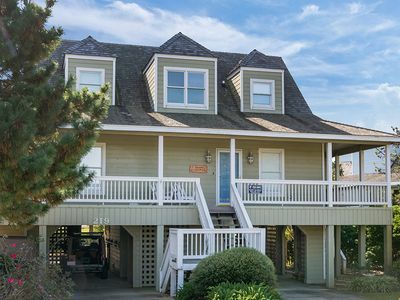 The oceanside sun deck is easily accessible from the great room and provides panoramic views of the Atlantic. 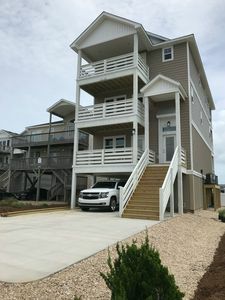 Elevator, private heated pool (28' x 17'; $400 pool heat fee) with a built-in kiddie pool with jets, 6-person hot tub under a sheltered trellis, 2 outside showers, large centrally-located grill area, outdoor sound system, private beach walkway with a 12'x12' dune top deck (with built-in seating), Wifi, 2 washers and dryers. Parking for 6 cars. 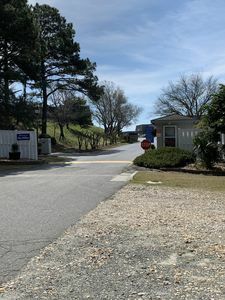 Pool, hot tub, grilling area, 2 outside showers, theater room, rec room with billiards table, shuffleboard, luxury wet bar with full refrigerator, dishwasher, icemaker, microwave, sitting area, large flat screen TV, King MBR, laundry room with 2 stackable washers and dryers, and a half bath. 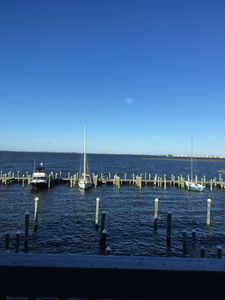 3 King MBRs (2 with ocean views and rear deck access), MBR with 2 Twins (can convert into a King), Queen MBR, MBR with 2 Bunk Sets, and a coffee station. Living room with gas fireplace, dining room, kitchen, King MBR, and a half bath. Special events are welcome with a maximum of 100 guests. A $3,000 event fee and a $3,000 security deposit apply. A locally licensed event planner/insured event planning company must be used and the name of the person and company must be submitted within 90 days prior to the event. This home is designed to be handicap-friendly, however not necessarily ADA compliant. 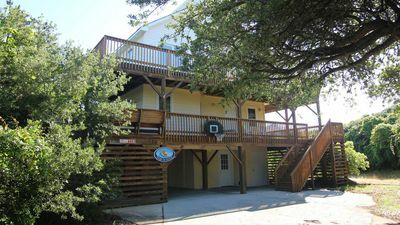 This home has a wheelchair accessible elevator, ramp and access to the pool area from the front of the home. Please note that not every room or area of the home will be wheelchair accessible. 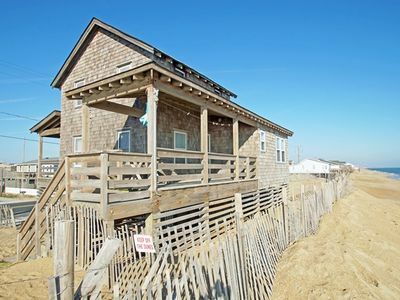 The home is located next to public beach access with a handicap-accessible beach ramp which is managed by the Town of Nags Head and is subject to change. *Cabana services are available for full week reservations only between 4/27/19-9/29/19. The cabana service is not available on your scheduled arrival day. Set-up does not take place in inclement weather conditions. 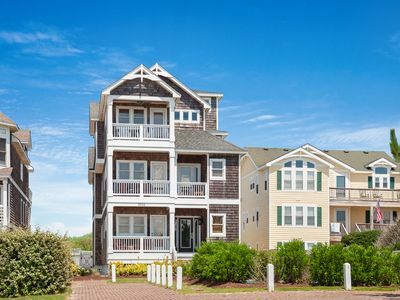 Family-friendly 2BD with Spectacular Sunset Views; Pool, pier, many amenities. 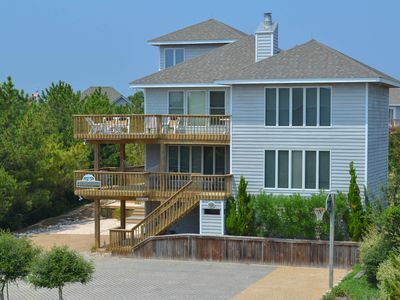 ONLY 370 feet to beach access! 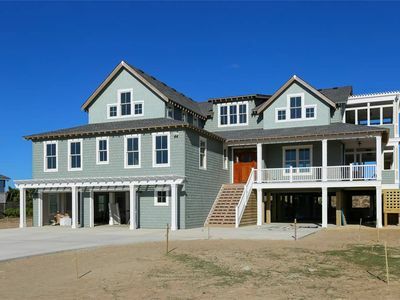 HUGE LOADED home! Private Pool, Hot Tub, Game room with Pool Table! D0216 Just For Fun. Pool Opens 5/4; Pool Heat Option, Close to Downtown Duck! 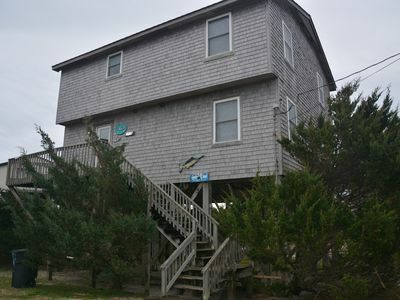 4BR Oceanfront home located on the beach in Kitty Hawk steps to the Ocean!!!! 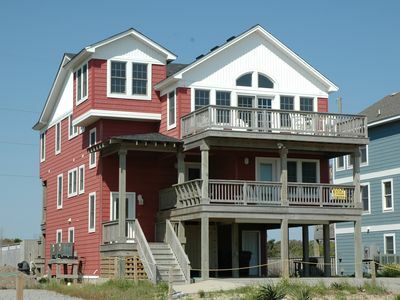 Beach Divas: 8 bedroom, oceanfront, private pool and hot tub, rec room with a pool table.